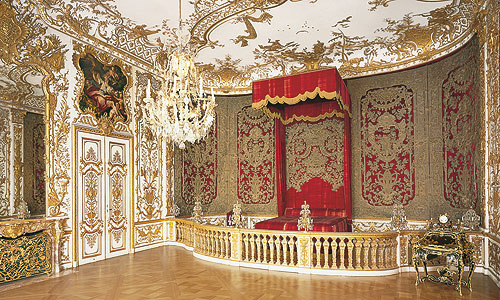 The Rich Rooms, which acquired their name in the 19th century, are a highpoint of the court Rococo style in the German-speaking region. Elector Karl Albrecht had this sumptuous suite of rooms designed and furnished from 1730 to 1733/37 by the architect François Cuvilliés. With these state apartments, Karl Albrecht sought to substantiate his claim to the imperial throne. Cuvilliés designed not only the floor plan of the rooms, but also their decoration – the wall paneling, stucco-work and some of the furniture. 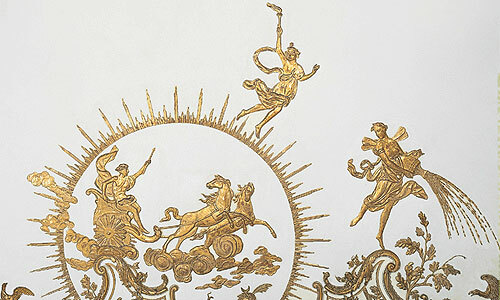 Working closely with the highly skilled court artists, he was able to create a unique series of interiors that are works of art in their own right and were enhanced by expensive furniture from Paris and precious textiles. 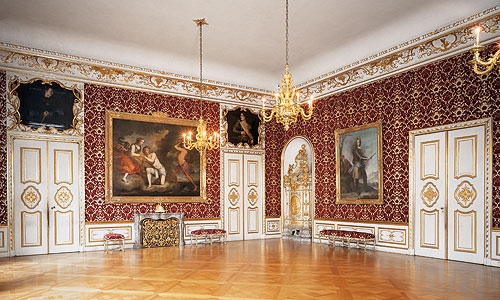 When the rooms were reconstructed after the severe damage in 1944, most of the stucco-work, wall-hangings and panelling was reproduced on the basis of the original decor, so that the rooms now look much as they did when first created. The Audience Room (Room 57) was the place where foreign envoys were officially received at court. The mandatory ceremonial route led through the two richly decorated antechambers on its north side and culminated at an even greater level of magnificence in the audience chamber. The Elector received his guest standing beneath a red velvet canopy. The Green Gallery (Room 58) was the setting for splendid festivities to which the Elector regularly invited selected members of court. 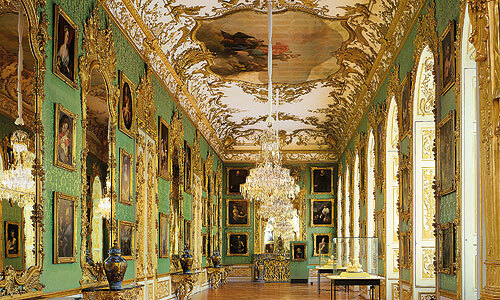 However, this room was not only used for festive gatherings but was also a picture and mirror gallery. 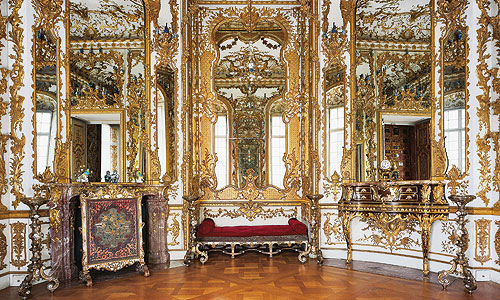 The over 70 paintings, arranged above one another in tiers of three and alternating with tall mirrors, are from the extensive collections of the Wittelsbach family. 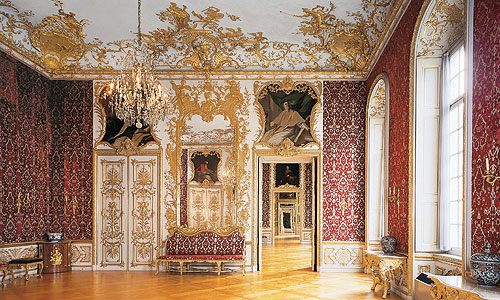 With their gilt frames, the paintings by various masters from different epochs combine with the stucco-work and carving of the room decoration to create a harmonious overall effect. Many of the paintings, including masterpieces of European art, were later transferred to other collections, in particular those of the Alte Pinakothek. 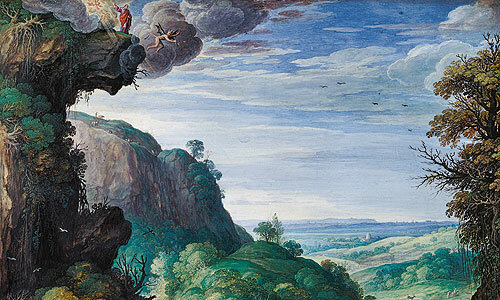 In 2011 it was possible to almost completely restore the original hanging arrangement with the support of the Bavarian State Painting Collections. The Green Gallery has thus been restored to its former function as an important electoral assembly room and a display of absolutist power. 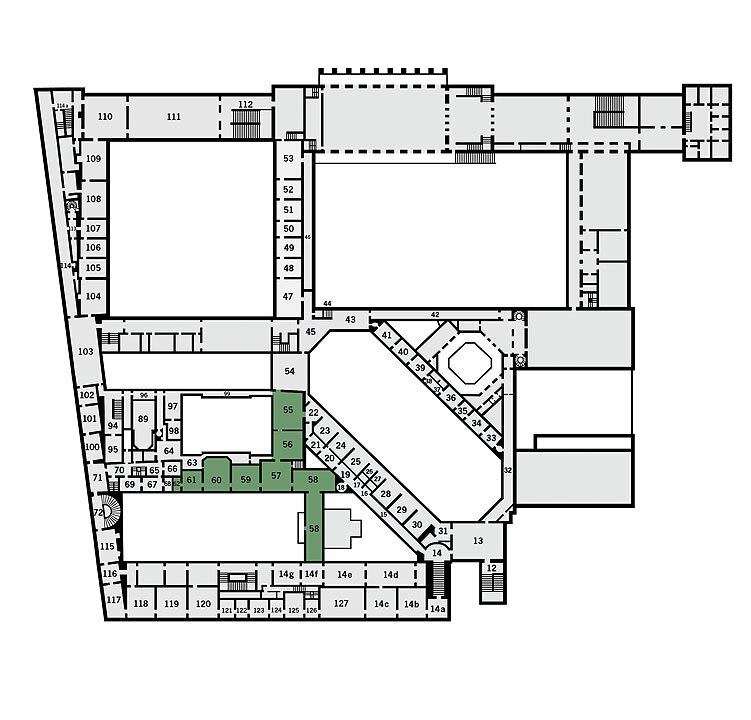 The Conference Chamber (Room 59) was reserved for private audiences for persons of the highest rank and members of the elector’s immediate family. 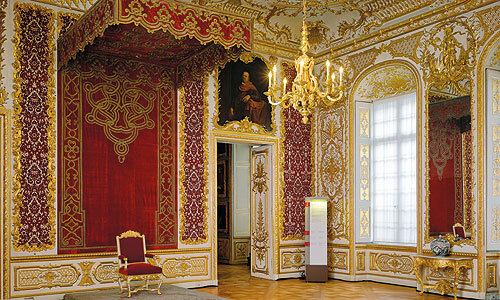 Because this room occupied a more important place in court ceremony than the other reception rooms, its stucco-work and carving are even more ornate. As one early document reveals, the magnificently appointed state bedroom in the Rich Rooms served "only display, not the comforts of relaxation" . 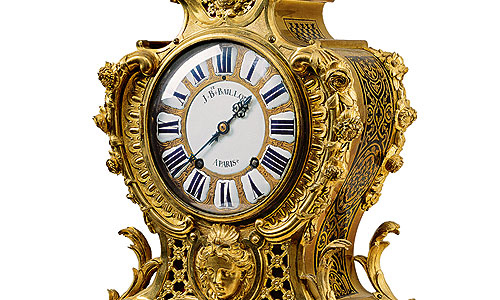 It was conceived solely in terms of its symbolic significance, following the lead of the French royal court, where the monarch's rising in the morning and retiring for the night took place in public, i.e. in the presence of the courtiers. 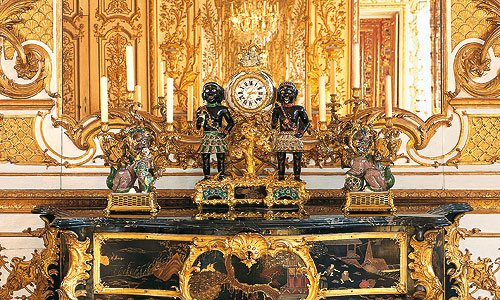 As a mark of its importance, the state bedroom was furnished with particularly lavish and expensive lacquered furniture, which Elector Karl Albrecht ordered from Paris cabinetmakers. Cuvilliés followed French practice by building two small rooms, or cabinets, onto the state bedroom. The first was designed as a room for writing and relaxing in, but was also equipped as a cabinet of mirrors and porcelain (Room 61). 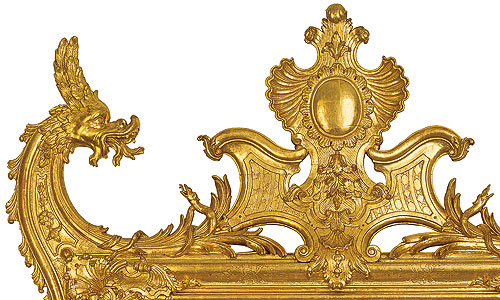 Large mirrors like these were among the most expensive decorative items of 18th-century aristocratic residences. 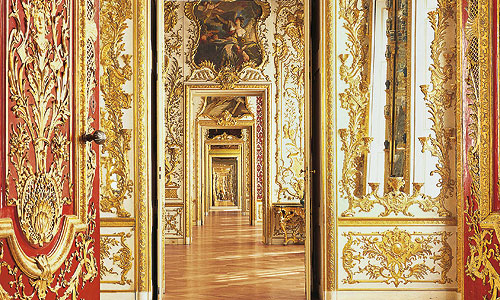 Their reflections multiply to infinity the gilt wall consoles, on which hundreds of small porcelain objects are displayed. 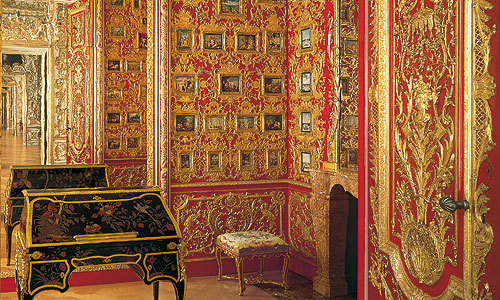 The Miniatures Cabinet (Room 62) is the last of the Rich Rooms. As an exclusive place of retreat within the apartment, this tiny room is particularly elaborate. 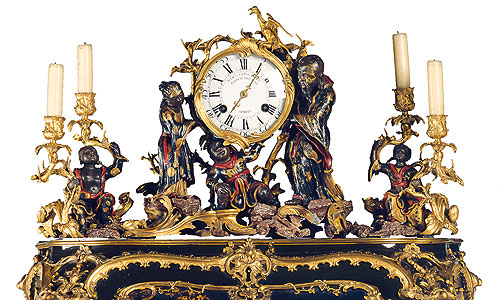 The exceptionally fine, fully gilt carving by Joachim Dietrich shows up against a red lacquer background that was extremely difficult to produce. Let into this exquisite panelling are 129 miniatures by Dutch, French and German painters from the 16th to the 18th centuries. With the exception of the two sets of doors and the miniatures, the Miniature Cabinet was completely destroyed in the Second World War; reconstruction of the lost interior was completed in 2001 after many years of painstaking work.